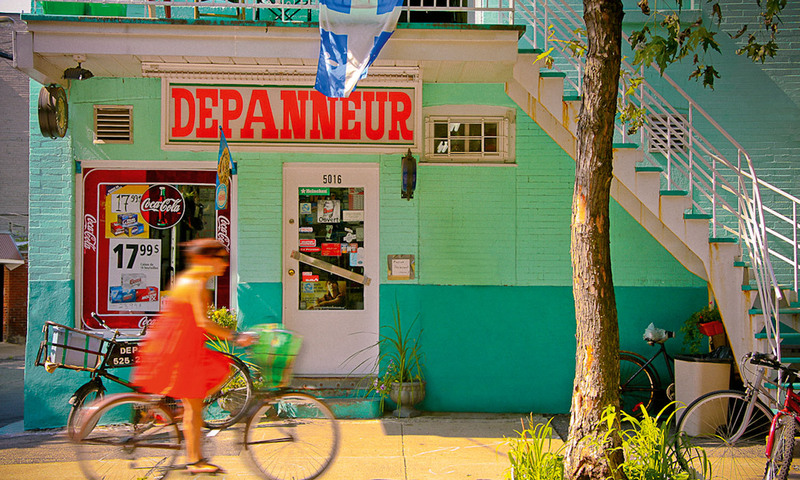 Armed with a French phrase book and the promise of a local delicacy at night’s end, Graeme Green takes in music, art and festival fun in Canada’s cultural capital. It’s the beating heart of Canada’s French-speaking Quebec region. More diverse, modern and vibrant than the capital Quebec City, Montreal is big enough to have all the arts, music, culture and nightlife you could want, but is still small enough to feel accessible. The influence of immigrant communities from Europe and other parts of the world has helped create one of North America’s most progressive, easygoing and up-for-it cities, famous for food, festivals and creative talent, from Cirque du Soleil to Arcade Fire. Start, as the French settlers did, at Pointe-à-Callière on the banks of St Lawrence River. Gallic explorers landed here in 1642 and spread across the region. With the towers of Notre-Dame Basilica on your left, walk along the waterfront, accompanied by local rollerbladers and cyclists, to the Old Port. Stop at Place Jacques-Cartier for a coffee at one of the cafes’ outdoor terraces, although you should be warned they’re touristy, pricey and often crowded. Another option worth exploring is the collection of small art galleries along Rue Saint-Paul and Rue Saint-Amable. Taking in the sights of the Plateau neighbourhood. Past the statue of Nelson and a short walk down Rue Notre-Dame is Saint-Laurent’s BIXI bike station. Quebec’s bike-sharing project, which Melbourne’s MBS system is based on, is a popular way to get quickly from A to B, and visitors armed with a credit card can use it. Time for a drink? Crescent Street, in the heart of Downtown, is a lively area of bars and restaurants and one of the few places you’re likely to hear more English than French spoken. For something more bohemian and Franco-flavoured, head to the Latin Quarter. You can ditch the bike at the BIXI spot on the corner of Rue Sanguinet. Get the party started at Les Foufounes Électriques. It’s just one block to Le Sainte-Élisabeth. This buzzing pub’s booths and dark leather sofas are filled with students, workers and travellers quaffing the local tap beers, but it’s the outdoor terrace and beer garden, surrounded by vine-covered walls and packed during summer, that makes this pub one of Montreal’s most famous. For something more rockin’, go around the corner to Les Foufounes Électriques, an industrial beer hall with pool tables, foosball and a band room downstairs. A fixture on the scene since 1983, it plays host to a heavily tattooed crowd, with punk and rock turned up to 11. Rooftop sizzling at SAT’s Foodlab. Move from the Quartier Latin to the Quartier des Spectacles. Notice the red lights on the street? Until recently this area was Montreal’s red-light district, and the arts and music venues display rose-coloured globes along the footpaths in a playful tribute to the past. Join an arty crowd on the top floor of the SAT (Society for Arts and Technology) building. Choose from the large bar and dining area bedecked with fairy lights, the outdoor roof terrace or a domed chill-out room with long, comfy cushions. All the senses are catered to, with DJ sets, live music, art, visuals and food. Chefs Michelle Marek and Seth Gabrielse change the menu at SAT’s Foodlab every two weeks, showcasing local ingredients in cuisines from around the world. Stroll through the Quartier des Spectacles and past Place des Artes, home to the city’s opera hall. Take a moment to watch the colourfully lit water fountains or, if visiting in summer, join the crowds at one of the free events that make up Montreal’s hundred or so festivals every year. In the huge open-air plaza of Place des Festivals, there may be a little jazz being played or a comedian getting some laughs. Also known as the Main, Saint Lawrence Boulevard (or Boulevard Saint-Laurent in French) is the major commercial and cultural street that once divided the poorer French districts of the city’s east from the more affluent Anglo side. Its southern section, featuring impressive wall-covering murals that are part of the regeneration of this slightly worn-down area, arrives at the city’s flat borough known as the Plateau. Montrealers have a reputation for liking beer as much as the Brits and Aussies. Stop for a cold one at Reservoir, popular with artists and film-industry folk. Laid-back beats play and, in the summer, the large front window is opened to the street. Through the glass behind the bar, you can see metal tanks of the beer made on site, travelling all of five metres from tank to table. All hands on deck at Casa del Popolo. There’s far more to Montreal’s music scene than Céline Dion. The city has produced Leonard Cohen, Rufus Wainwright, Grimes and world-class jazz musicians. You’ll pass by the home of Montreal’s most famous son, Monsieur Cohen, as you wander through Little Portugal and into the hipster Mile End district. In recent times, this area has become populated by musos, artists, filmmakers and photographers, partly inspired by the presence of Arcade Fire. Stop at Casa Del Popolo, one of two music venues (along with Centro Social Español across the street) owned and run by Efrim Menuck of Montreal noisemakers Godspeed You! Black Emperor. A veggie cafe by day, by night it transforms into a cool bar with bands in the back room bashing out the sounds of the underground, from garage rock and punk to indie and experimental. Just a short walk away is Buvette Chez Simone. Honestly, this is a restaurant – it only feels like a club. A female DJ is at the decks behind the bar, dancing with the staff and revving up the night’s drinkers and diners with house music and 80s classics. Find a quiet(ish) spot at the back and order delicious plates of charcuterie and cheese. The menu changes often, but if fried balls of mackerel are available, you’re onto a winner. By 1am, Salon Daomé is pumping, so unless you want to wait in line it’s best to arrive soon after midnight. It’s a local hotspot for good reason: the atmosphere’s friendly, laid-back and unpretentious, with an intimate lounge feel, mirror balls, arresting visuals, and – most importantly – energetic electronic music that will keep you on the floor till the early hours. There’s only one way to soak up the booze: with the Québécois ‘delicacy’ poutine. La Banquise serves classic poutine – a heaped portion of French fries, cheese curd and gravy – as well as more novel versions like La Elvis, with added beef mince, capsicum and mushrooms. A lighter, classier post-club option is to stop by landmark St-Viateur Bagel, here since 1957 and open 24 hours. If your get-up-and-go hasn’t gone by now, take your late-night feast to the top of Mont Royal (taxi recommended) to watch the sun come up over this never-disappointing city. Air Canada flies from Sydney to Montreal, stopping over in either Vancouver or Toronto. Chic and sleek, Hotel Zero Un (or Zero1) has a designer feel but affordable prices. Rooms cost from about US$130 a night. Just a few steps from the Place des Festivals, it’s a good spot to be close to the summer festival action. Check the tourism board’s website.